One of the defining characteristics of track and field is the extent to which the athletes stay in close contact with the ground. Even in the field events, the ability to jump or throw effectively relies first and foremost on your ability to use the ground to your advantage. As a result, the way that an athlete uses their feet has an overwhelming impact on how well they can apply their whole body to the demands of any particular event. And those footwork patterns vary by event, and often, even by athlete within a single particular event. Now, I'm definitely not an actual biomechanist, but after 2 decades of track and field, I've noticed at least a few patterns. So when I went down to L.A. to cover the Mt. SAC Relays, I tried to spend some time capturing how the footwork in each event conveys a sense of each event's specific characteristics. 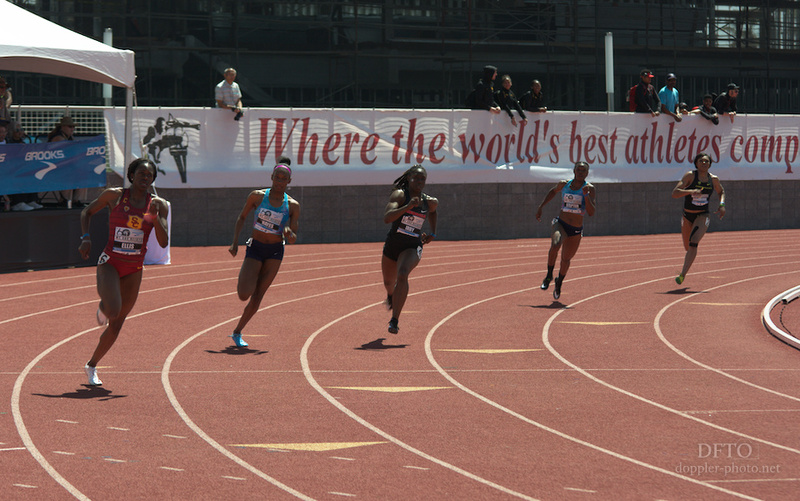 The running events in track and field are often grouped into three loose categories: sprints, mid-distance, and distance. Sprints are up to 400m, and tend to be events that benefit most from anaerobic performance — some world-class sprinters will actually hold their breath for an entire 200m race, because sprint posture suffers when an athlete inhales and exhales. Mid-distance typically falls from 600m to 1500m, and distance is longer than that: typically up to 10km in a track setting. 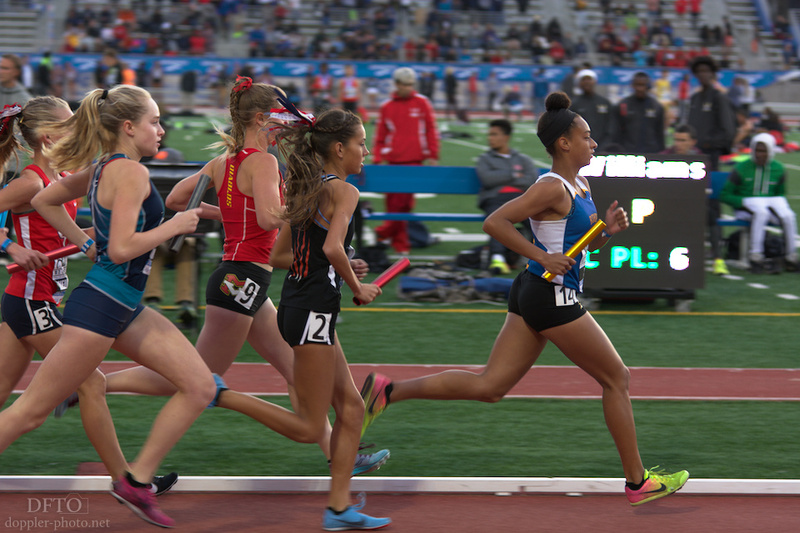 Looking at the athletes' footwork and body posture, however, it's easy to spot a number of similarities that cut across the different distance classes, and also to make some guesses as to why the differences in technique manifest the way that they do. 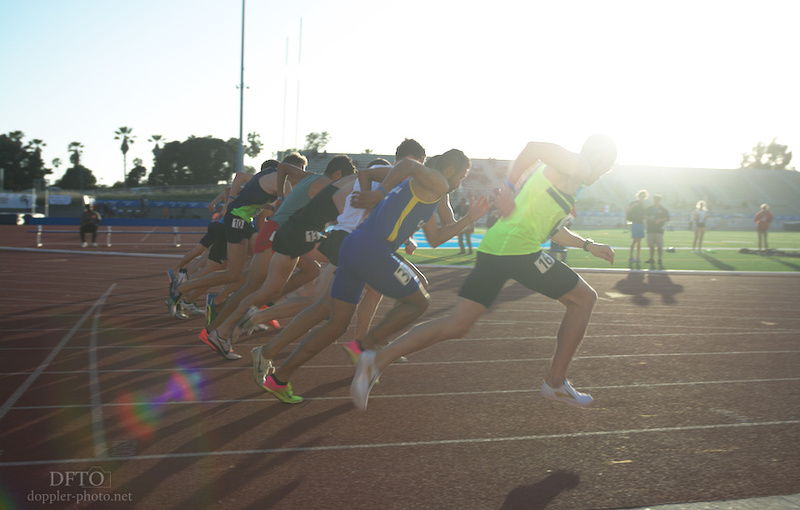 At the outset, there's an obvious difference in that sprints and (in some meets, the shorter mid-distance events) use block starts, whereas the longer races tend to use any of a variety of group starts. 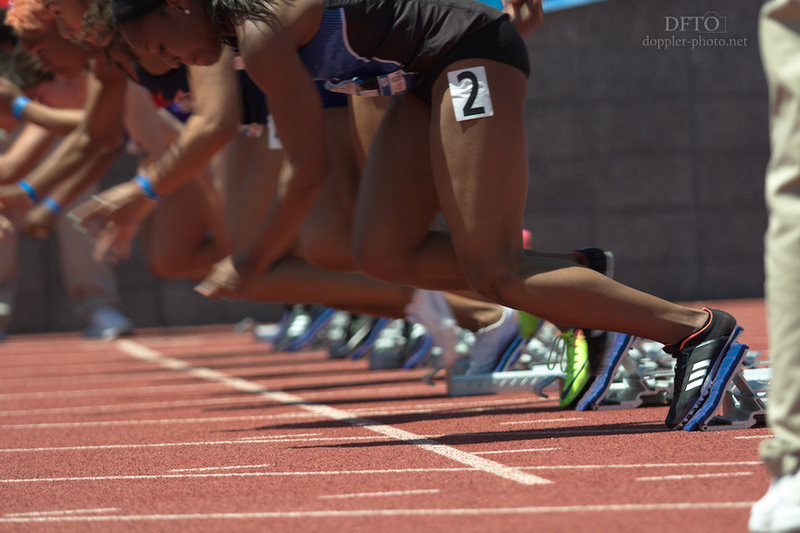 The main benefit of a block start is acceleration efficiency — the low body angle, combined with a large number of long spikes beneath the blocks themselves, allow the athletes to push forward with a level of force that would likely cause their feet to slip along the track during any kind of unaided start. On the flip side, it takes a certain amount of energy to raise from the block start position to the upright running position, and for longer, lower-speed races, that initial spike of energy expenditure is likely not worth the proportionately negligible time reduction that would result. After the start, though, the athletes all accelerate pretty aggressively, and those accelerations look pretty similar. This is what's commonly known as the drive phase. Because of the blocks, the sprinters have a much steeper lean angle, but you can see that in both cases, there's a significant gap between the athletes' heels and the ground, and there's a significant forward body lean. The drive phase ends earlier as the race length increases, both because it takes less acceleration to reach a lower average speed, and also because during the longer races, it's likely that the athletes will start off slower than max speed and match speed with the rest of the pack, at which point they'll monitor how the rest of the field is behaving and make strategic decisions about where in the pack to run, how hard to push, and when to possibly make a break for the lead. It's easier to make those strategic judgments when you're relaxed and have your head up to survey the situation. 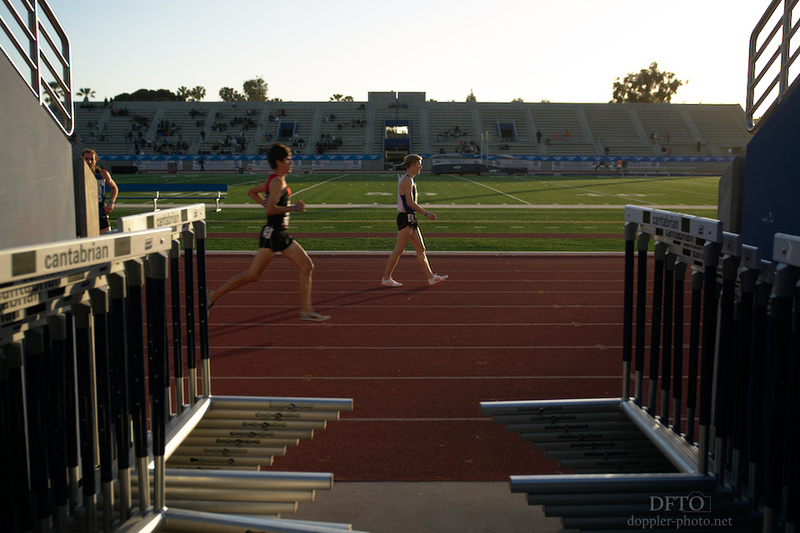 After the drive phase, the runners enter a phase where they focus on maintaining their speed. For all distances, this involves a much more upright running posture, and a much flatter footfall on the ground. 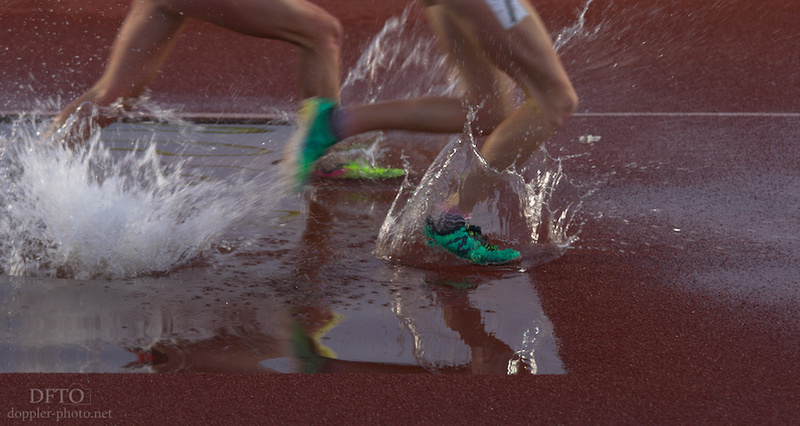 In longer distances, the heel will actually contact the ground, and the runner will roll from a mid-foot landing (with heel contact), to the ball of the foot, and off the toe. 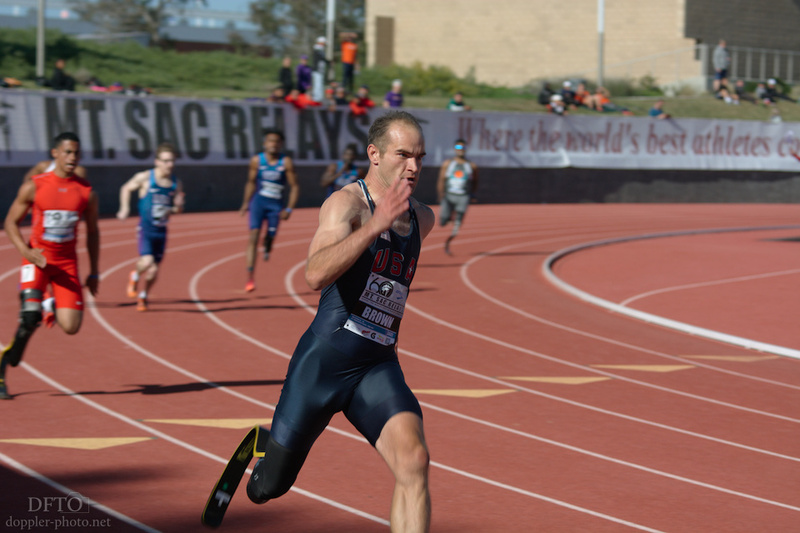 For sprint distances, the heel typically will not touch the ground, but it will come close. In both cases, there's a significant contrast between this phase and the foot/heel postures in the drive phase. It's interesting to note, in the case of the sprinters depicted above, how much force and energy go into maintaining their high speed on the curve. You can see that the ankle flexes toward the outside of the curve as the athletes use their legs to actually turn the corner. And finally, there's some kind of steady-state. 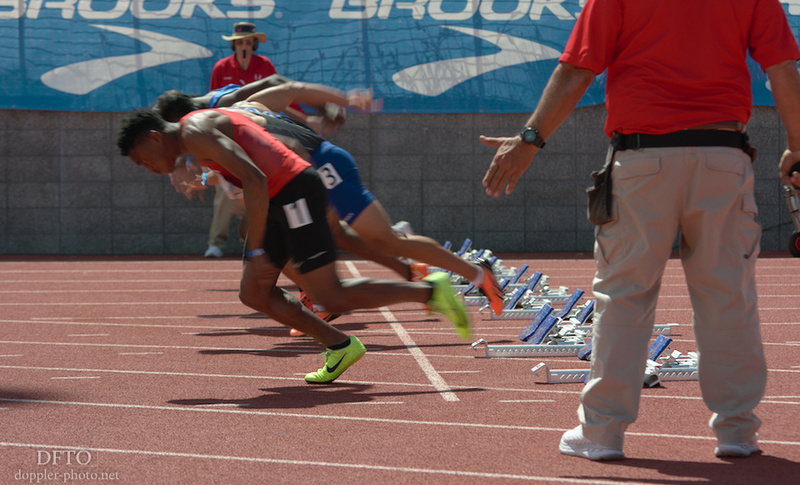 For sprinters, this involves managing their technique and effort so that they minimize the deceleration that's inevitable as they approach the end of the race. For longer-distance runners, they might accelerate or decelerate strategically, but they'll typically opt for more-efficient techniques as they approach the end of the race. And more generally, you'll typically notice that more-energetic running tends to involve more distance between the heel and the ground — the runner is spending more time on the ball of the foot, and using the foot as a longer lever that can impart more force to the ground. Less-energetic, more-efficient running tends to involve more full-foot ground contact — there's less force applied to the ground, but also that means less tension on the muscles of the lower leg, and so less energy expenditure. And more time on the heel means more static support of the athlete's body weight, which translates to further-reduced energy expenditure. At the slowest extreme, a walker spends a significant amount of time with their weight being supported toward the heel end of the foot. Tune in next time for field events and "how many spikes does it take?" Subscribe now to be notified when it's posted!